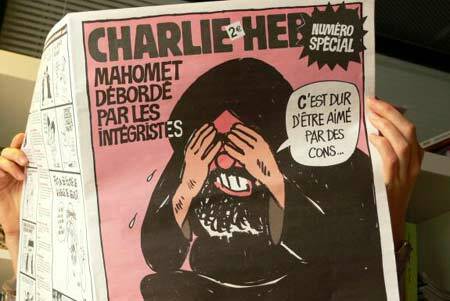 The French satirical weekly Charlie Hebdo (CH) has a picture of Muhammad on today’s front page. The prophet is crying because, he says, “it is hard being loved by idiots.” Muslim groups in France tried to prevent the distribution of CH by court order, but the court turned down the request because the complaining party failed to name Philippe Val, CH’s publisher. Mr Val, who says that he wants to defend the right to satire and sarcasm, has been put under police protection, as have CH’s offices and its editors. CH’s stunt is definitely a provocation and an insult to Muslims. CH is not a very nice paper and has a reputation for provocation (as had Theo van Gogh). In Western tradition, however, there is a difference between morality and law, as the Italian Catholic politician Rocco Buttiglione unsuccessfully tried to explain to the European Parliament on October 5, 2004, shortly before it vetoed him as European Commissioner for Justice because he considered homosexuality to be immoral (though not illegal). It is strange that neither CH nor the Muslims threathening them seem to realize this. In our cartoon campaign we do not endorse any anti-Semitic, homophobic or sexist stands. All we are trying to do is to confront Europe with its own hypocrisy using sarcasm and cartoons. We will therefore continue our sarcastic campaign in the days to come and we will not be intimidated by the ridiculous law suite that was filed against us in the Netherlands. Last week the AEL website posted a cartoon of Anne Frank in bed with Adolf Hitler. This elicited a legal complaint in the Netherlands. Yesterday the AEL published a rude cartoon about the Dutch politician Ayaan Hirsi Ali. The Belgian authorities do not seem prepared to press legal charges against Abu Jahjah and his Brussels based website. This is interesting because Belgium has very repressive hate crime legislation which it never hesitates to use against the largest party of the country, the Flemish secessionist and allegedly “Islamophobic” Vlaams Belang party. In my article here last Monday I wondered whether the Belgian authorities would use the same legislation against Abu Jahjah, but indicated that they probably would not because Belgium signed an agreement with Muslim extremists in the 1990s, to the effect that Belgium agreed to turn a blind eye to the activities of extremists and terrorists so long as they refrain from perpetrating terror attacks in Belgium. This agreement apparently still holds. In the Belgian parliament yesterday Laurette Onkelinx, the Belgian minister of Justice and a leader of the Parti Socialiste, declared that the federal government of Belgium would not ban Al-Manar, a radical Arab television network that has been outlawed in both of Belgium’s neighbouring countries, France and the Netherlands, as well as in the United States and Spain. Yesterday the Canadian website Global Research published an article by Ghali Hassan, a Muslim immigrant who lives in Australia. Hassan writes that “Small countries such as Denmark, Belgium, the Netherlands, Austria, and Norway are leading the pack in the war on Muslims at home, and may be on the road to encouraging a new Holocaust against humanity.” The American Justin Raimondo writes today on antiwar.com, in an article about the Danish cartoon case that the 12 cartoons were originally published with the intention to “mold mass attitudes and whip up entire populations into a state of hysteria. […] That’s what this is all about: the hate propaganda emanating from certain quarters in Europe and the U.S. amounts to preparations for war.” It is perfectly legitimate to oppose the war in Iraq (as some of my American friends do). However, to depict the Danes as warmongerers and the fanatical Muslim immigrants who are attempting to impose Islamic law in Europe as victims, is something which so far I have only heard from these extremist Muslims themselves, from Bill Clinton, and from the loony left. Submitted by bhaddock on Thu, 2006-02-09 02:06. Iran has Mohammed on buildings! Submitted by foreign devil on Thu, 2006-02-09 01:33.